Dillin’s dependable Mass Flow Accumulator provides mass product accumulation with minimal back pressure utilizing our AIR DECK® conveyance technology during minor equipment downtime events or change-overs. This method can be used for buffering or accumulation. This Mass Flow Accumulator can be integrated with Dillin’s: Product Handling Conveyors, Merge/Divert Stations, Slat Sorters or Automatic Lidders/Cappers to complete your production system requirements. 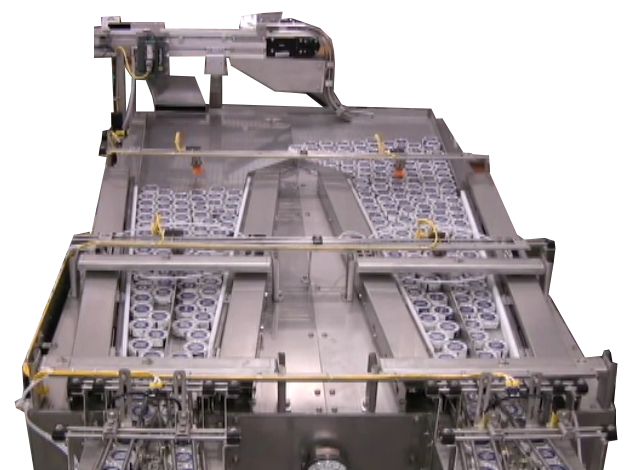 Innovative AIR DECK® technology elevates and conveys product to single or multiple out-feed lanes. Available with reciprocating arm design to reduce pressure and prevent jamming of product. Applicable for round container designs. Provides smooth low-impact product conveyance. No plant air required for conveyance of product.